What Are The Best Online Bachelor's in Music Programs? What Else Can I Expect From an Online Bachelor's in Music Program? Music lovers can now pursue an online bachelor's degree in music. The online degree is ideal for those who are passionate about music and want to teach, produce, or perform music. Advances in sound and recording technology make pursuing a music degree more interesting than ever. Because many jobs in the music industry rely on fluctuating arts funding, career growth for the field as a whole is difficult to determine. However, the Bureau of Labor Statistics projects that some music jobs, like choreographer, will grow as much as 24% due to an increasing popularity in dance schools. Continue reading for more information about what you can do with a bachelor's degree in music. Students earning a music bachelor's degree online learn all aspects of music, from the theory of music to the composition of music for commercial jingles and video games. The diversity of programs ensures that you can find the perfect fit for your interests. While some programs focus on students mastering a particular musical instrument or family of instruments, others focus on industry-related areas like sound engineering and the business of music. Regardless, students learn about musical genres like jazz, world music, hip-hop, and orchestral music. Some programs also offer courses in songwriting, the history of music, and reading music. In programs that focus on performance, students may have to audition or perform as part of their application process. Some programs also require students to take face-to-face lessons that they must then transfer as credit towards the program. Some programs may require students to perform solo or participate in an ensemble or choir as part of their academic assessment. Other programs require students to complete a musical capstone project involving a thesis, recital, or composition. Depending on the program, students study to become music therapists, sound engineers, songwriters, performers, music teachers, or composers. 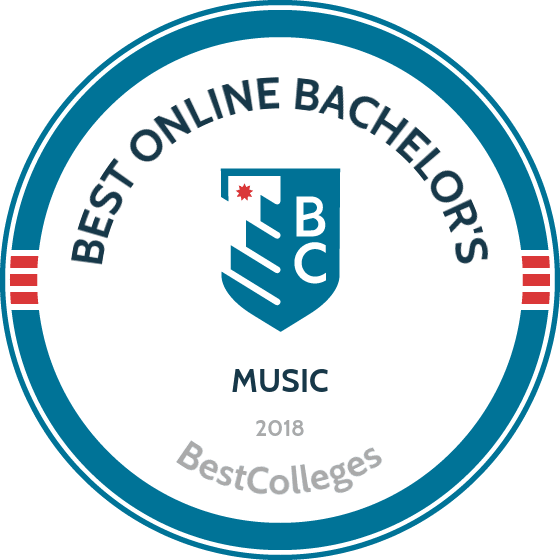 If you plan to pursue a career in music or a musically related field, an online music bachelor's degree may be right for you. Located in Boston, Berklee College of Music is the world's largest independent college of contemporary music. What's more, its online campus offers several online music degrees including the bachelor of professional studies in music business, the bachelor of professional studies in interdisciplinary music studies, the bachelor of professional studies in writing and producing music, and the bachelor of professional studies in music production. Online learners at Berklee take 120 credits to complete their bachelor's degrees, including 42 general education credits, 30 required course credits, and at least 18 other credits in a specialization of their choosing. Courses include music business 101, vocal production, the art of mixing, and microphone techniques. Applicants for admission to Berklee Online submit high school transcripts or GED scores, letters of recommendation, and a video or essay discussing their background and career aspirations in music. Students may reduce their program length by transferring in up to 60 credits earned at another institution or by gaining up to 30 credits through prior experience. Berklee's online learners pay 64% less in tuition than on-campus students. Located in Carrollton, GA, the University of West Georgia offers a bachelor of music with a major in composition. Though this program cannot be completed entirely online, it does feature an online component. This program is specially designed for students who want to become composers or eventually seek teaching positions in higher education. Students completing UWG's bachelor of music must complete 120 credits, including courses in music theory, various histories of music, and aural and keyboard skills. In addition to studying conducting and composition, students must also perform in recitals. Mature students may reduce the number of required credits by taking advantage of UWG's credit-by-prior-learning program. UWG's online bachelor's degree in music enrolls learners in the fall, spring, and summer semesters. Freshman applicants submit high school transcripts showing a college preparatory curriculum and acceptable SAT/ACT scores. Adult learners, transfer students, homeschoolers, and others with a non-traditional educational background should inquire about special admission processes and requirements. For students still considering if eLearning is the right choice, UWG offers an eCore intro quiz. With a campus in Valley City, ND, Valley City State University is "a national leader in online music education." Indeed, the school offers an online bachelor's degree in music, ideal for a range of students and adult learners like military members serving overseas and those who work full-time jobs or have family commitments. Learners in VCSU's online bachelor's in music take core music courses, performance-related courses, and various electives. They conclude the degree with a capstone project—a thesis, recital, or composition. VCSU offers its online courses in real-time, which means learners ideally go online during an arranged class time. Students who cannot join the class may watch the archives later. All courses are available online, but learners take performance classes in-person. The school's bachelor of arts in music and bachelor of science in music accept applications for the fall and spring semesters. Besides an application and transcripts, future students must submit an audition DVD. Full-time students normally complete the degree in four years, but they may shorten this time by transferring courses previously earned at other institutions. Digital learners at Texas State University in San Marcos, TX, can complete online anywhere from 25 to 49 percent of their music bachelor degree or music studies bachelor degree. The bachelor of arts in music at Texas State requires 120 credit hours while the bachelor of music in music studies requires 129. Learners enrolled in each of these programs must complete all general-education requirements, select a minor, demonstrate proficiency in piano and theory, and undergo an upper-level competency review. Courses include music theory, aural skills, and the history and analysis of music. Finally, the program offers optional minors in jazz and mariachi. All applicants to Texas State's partially online music programs submit an application and audition on their instrument or voice the semester before they plan to attend. A perk: students who live too far away from campus to audition in person may send in a recording. The bachelor of music in music studies can lead to certification as a music teacher in the State of Texas. Part of the University of Maine system, University of Maine-Augusta offers an online bachelor of music in contemporary and popular music. Boasting an ideal student-to-faculty ratio and modern facilities, UM-Augusta considers itself "Northern New England’s preeminent modern music education resource." Digital learners enrolled in UM-Augusta's program study, among other topics, audio, sonic arts, composition, and/or performance. The major's curriculum also requires courses in audio recording, electronic music production techniques, advanced composition, improvisation, and transcription. For admission to this online music program, applicants must schedule an in-person audition or submit a recorded one. Students who do not feel ready to audition can enter the associate degree program (it does not require an audition) and then transfer into the bachelor's program. Non-Maine residents pay a reduced fee of a Maine resident's tuition in UM-Augusta's online programs. Because of the diversity of online music degree programs, details of individual schools, curricula, and programs may differ from those discussed here. However, most programs tend to offer certain courses that focus on fundamental objectives in music. Course offerings differ from school to school depending on the program's focus: music production, music theory, music education, or the business of music. Regardless of focus, most programs offer courses that cover specific genres and instruments, such as jazz, world music, electronic music, woodwinds, or piano, as well as certain subjects within the discipline. Below you will find a list of sample courses that offers a general view of course topics. Instrumental methods and repertoire: Students learn fundamental music theories and develop their skills with a variety of instruments in preparation to teach instruments to students in a school setting. This course prepares students to become band or orchestra teachers, music therapists, and performers. Music composition: Students learn the art of composing and writing music for a variety of contexts including live performances, film, television, recitals, video games, and personal enjoyment. Students learn about melody, harmony, and rhythm and how to write music that creates an emotional impact. In addition to standard music theory, students explore modern innovations in sound production and instruments. Music business: Students explore trends and topics in music business in preparation for entering the music industry. They learn about concrete business subjects, such as copyright, licensing, publishing, retailing, and marketing, while also focusing on technology in music, the future of music, and how to discover new talent. How Long Does It Take to Get a Degree in Music? Full-time students typically earn their online bachelor's in music degree in four years, although some programs offer accelerated course options that lead to early graduation. Most online music degree programs require around 120 credits of coursework. Some schools follow a cohort learning model in which students advance through their courses together, meaning students do not work at their own pace but in synchrony with their peers. Other programs are self-paced, allowing students to advance through their courses as slowly or quickly as they prefer. Part-time enrollment also affects how long it takes to earn your degree. Students can often complete their degree in less time if they transfer into the program with credits they have earned at another accredited university. Students studying a particular instrument who are not yet proficient may require additional semesters of lessons or ensembles in order to earn their degree. Accreditation agencies ensure that schools adhere to certain standards, which assures students that they are receiving a quality education for the cost of their tuition. The U.S. government does not accredit schools nor does it create accreditation agencies; instead, it provides a listing of recognized accreditation agencies that people can refer to when researching schools. Schools receive either regional or national accreditation. In general, regional accreditation is more prestigious than national accreditation. State-based and nonprofit institutions are usually regionally accredited while private or for-profit schools receive national accreditation. When looking at a school's accreditation agency, it is most important to determine whether the school is regionally or nationally accredited and that the name of the accrediting agency directly matches the name of the agency listed on the government's website. You should keep in mind that a degree from a nationally accredited school may not count toward transfer credits, graduate school requirements, or some job requirements. Common regional accrediting agencies are the Higher Learning Commission and the Middle States Commission in Higher Education. Well-regarded accreditation agencies among bachelor's in music programs include the National Association of Schools and Music and the National Association for Music Education. The U.S. Department of Education (ED) approves accreditation agencies and provides a listing of all approved agencies. The ED also provides a list of program-specific accreditation agencies for specialized programs, such as education, community and social services, and arts and humanities. The Council for Higher Education Accreditation (CHEA) is an organization comprising more than 3,000 learning institutions and 60 accreditation agencies. CHEA advocates for self-regulation of educational quality through accreditation. Together, these two organizations ensure that schools meet certain criteria and standards of quality education. You can explore a list of all accredited schools on the ED's website, or on CHEA's website. Many people who work in music pursue music as a secondary career option, relying on another form of employment as their primary income source. While many musicians, singers, and performers are self-employed, earning money on a per-hour or per-project basis, those who work as music educators, music therapists, choreographers, composers, and directors can enter full-time careers that earn livable wages higher than the national median salary for all workers. Those who earn a degree in music go on to work in a variety of musical contexts. While many musicians are self-employed, the degree also prepares people to enter careers in directing and composing, music education, music production, music therapy, music business, and choreography. While performing musicians and singers do not necessarily need to possess a formal degree, many naturally creative individuals who make music choose to pursue a degree in order to refine their skills or learn how to teach their craft to others. Below are some examples of careers you can pursue with a bachelor's in music. Music teachers at the elementary, middle, and high school levels teach students how to sing, read music, play instruments, and perform musical plays. At the elementary school level, music teachers introduce students to the art of music as a whole, teaching them about different styles of music and instruments. At the middle school and high school levels, music teachers help students further explore and refine their musical abilities. Recreational therapists provide creative therapy approaches for those with illnesses or disabilities. Music-based recreational therapists utilize music as a therapeutic tool, using songs and instruments to help increase their patients' overall well-being. They work primarily in schools, hospitals, and retirement homes. Producers and directors help create many forms of entertainment: television shows, plays, movies, commercials, and live performances. They work long and untraditional hours, often under tight deadlines and extreme pressure. Most producers and directors work with a script that requires some amount of creative interpretation, and use music to enhance their production. Dancers and choreographers help bring narratives, ideas, and emotions to life through dance. Most dancers and choreographers work with performing art companies, though 25% are self-employed. Dancers and choreographers may also work for private dance studios that offer dance classes and host recitals. Professional organizations in the music industry advocate for performers, musicians, music educators, and sound workers, ensuring that the industry treats their work fairly. Some organizations hold annual conferences, offer financial or scholastic assistance to researchers, perform outreach initiatives, and hold award ceremonies to honor excellence in the field. In general, these organizations serve as community builders and networking hubs for recent college graduates and experienced music professionals alike. The AFM is the world's largest union of musicians, uniting more than 80,000 musicians and music workers to work for a stronger, more equitable music industry. The Recording Academy is an arts advocacy and outreach organization that strives to honor the past, present, and future of the music industry. Among other projects, it is responsible for hosting the Grammy Awards. The SAM strives to spread music education throughout America, serving music educators, librarians, composers, performers, and the public. The society holds annual conferences, advocates for music research, designs music curricula for K-12 educators, and enacts public outreach programs. Students interested in receiving financial aid in the form of loans, grants, and work-studies must complete a FAFSA form. Some music programs offer additional scholarships to students based on talent or skill. Some programs hold auditions to assess a student's performance ability and offer funding to exceptional candidates. It's important to research each school's funding to determine the availability of additional aid and awards.